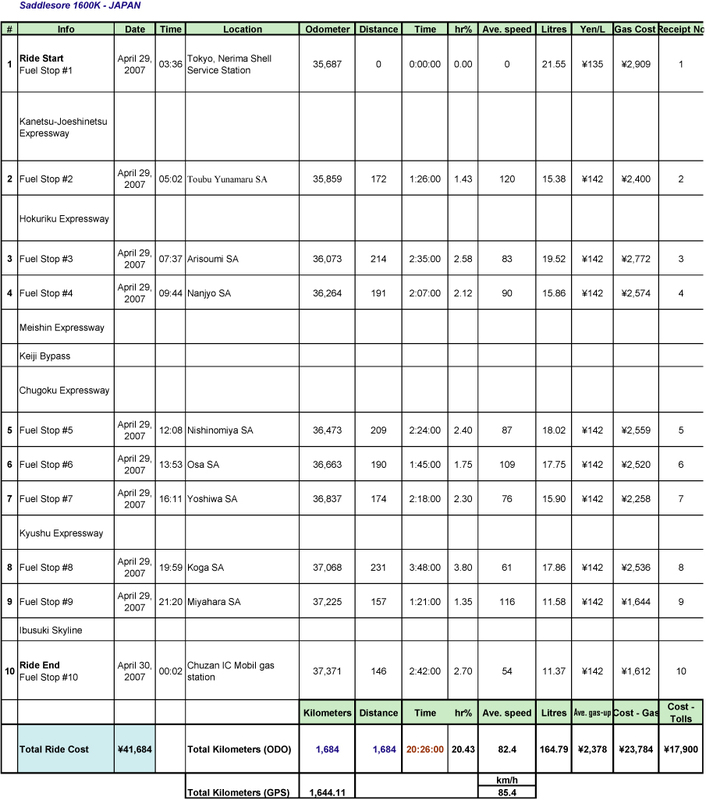 EYEWITNESS FORM Bilingual translated paperwork in printable PDF format right here! 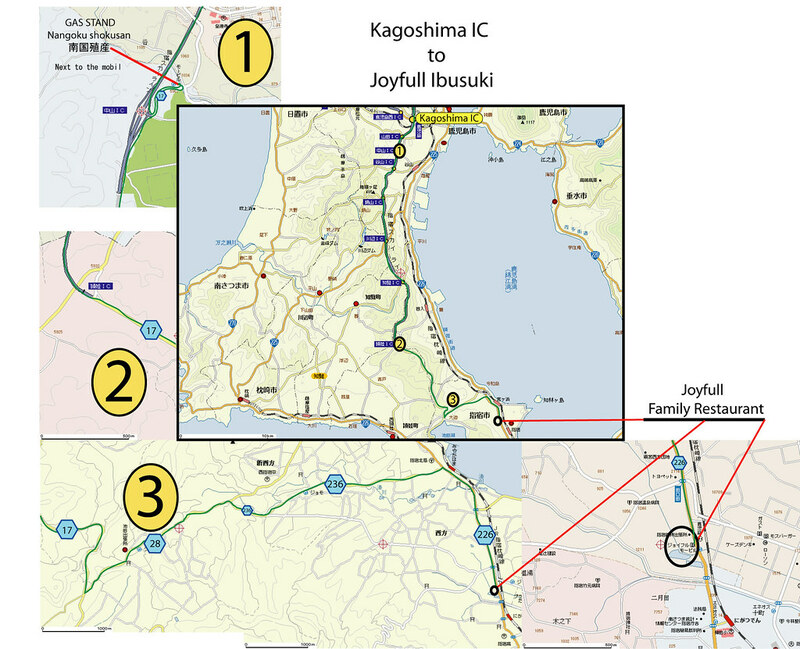 To Ibusuki- KagoshimaThis route was chosen so as to fulfill the 1600+km/24hr necessary for the IBA Saddlesore. It is the long way to Maibara, east of Biwako, but from there it was the most direct route. 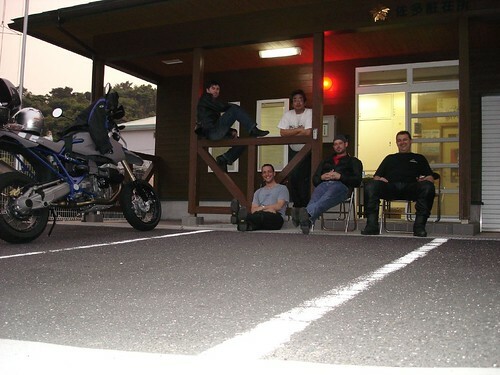 Using the Tomei, to Maibara, shaves off around 230km. Once you hit that last gas stand at Chuzan IC you will have over 1600km and need a feed. After your feed you may need somewhere to camp. How about under some palm trees near the beach? # Correction # the 6th Gas Stop is not Daisa but Osa. 24hr Gas stand going south. 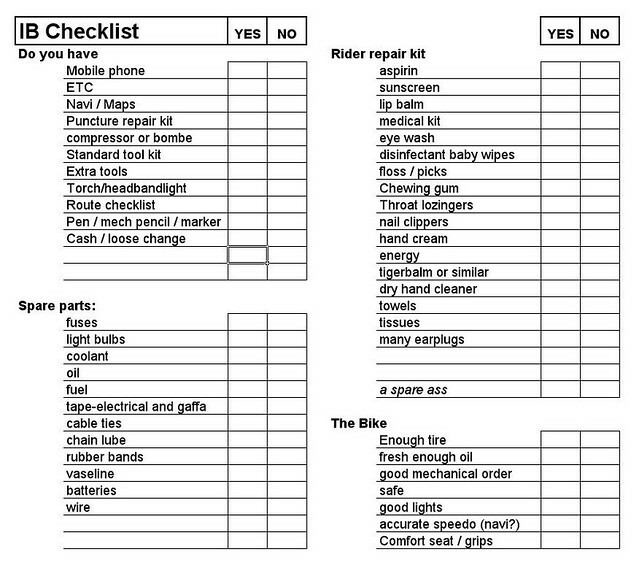 Remember to rest when tired, eat when hungry and ride ride ride! What a ride! 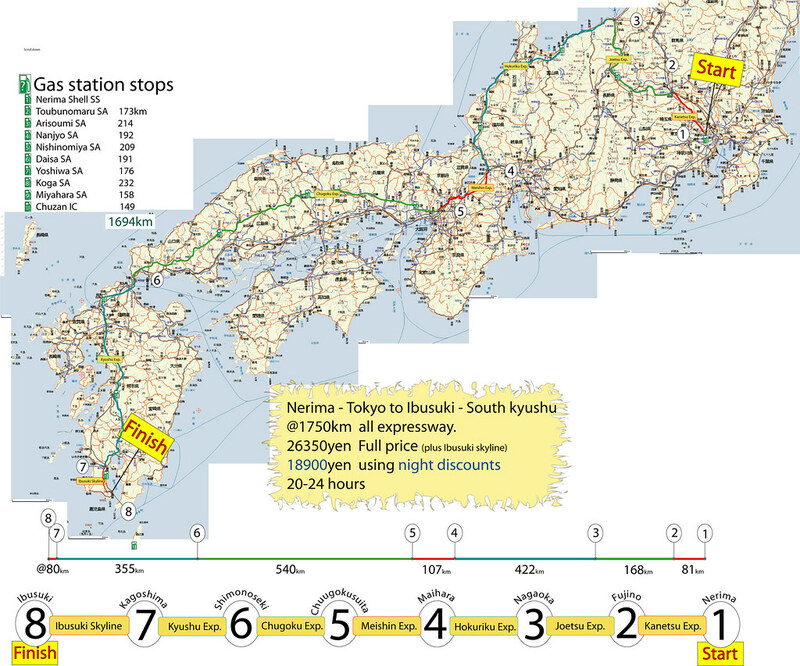 Tokyo to South Kyushu via Nigatta encompassing 1700+kms, 7 expressways, 2 bypasses and ending with a Skyline run to remember. Leaving the big city and firstly heading into the mountains, then over to the Japan sea, followed the coast west before swinging south for Kansai, through to the Chugoku and the west of Honshu before skipping over into Kyushu and running south again for Kagoshima and ending finally in Ibusuki. Sounds easy enough. Now do it in 24 hours with Goldenweek traffic. The call had gone out for anyone crazy enough to try this about 3 months prior to Goldenweek. A few came and went reluctantly and in the end we had 5 solid starters. Well there is no easy way to put this other than to say we were/are all riders. A mixed group yes, a close group no. But all that has changed. Brothers in iron. First to pipe up was Michel, an experienced tourer/camper with a jovial community spirit, a knack of keeping a smile on everyone’s face and the unluckiest and luckiest member of the ride. As I write this he is still out there somewhere, in the rain pushing the CB on. Ide was a surprise entrant from the North. Mr Consistent. Every time sighted on the run he was either gassing up or sitting proud on his road monster. The first to rise and last to sleep, a true ironbutt. A magician in the saddle, with little fear and a joker’s heart. What he had the HP2 doing through the twisties was a revelation. Quick with a smile, a great ride partner and the true navigation master. Tony joined in the last few weeks and became the tour master in the hunt for better roads once the ironbutt run was done. A true rock in testing times with a lingual gift and a right wrist that loves to twist. Thanks to overzealous US immigration checks or they knew of the legend, James joined the circus last minute. The original and best Ironbutt. Enthusiasm counts for nothing without experience or preparation. James had all three locked away in his GIVI box. Man, this guy can ride forever. Seriously, if there were a marathon for riders he’d be a horizon ahead. Managing to actually ride the tyre of it, again he steered the FJR through hell to the finale. That leaves me, the instigator and ironbutt route planner. Although I’d never gone 24hrs in the saddle, James and I had racked up some serious ride time/distance previously which inspired the delusion that 1600+ expressway kilometres should be a breeze. I guess by the width of my grin the guys knew I was in heaven. The plan was to meet at Nerima at 3am and all were witnessed, gassed up and on the road for 3.40am. Shooting north on the Kanetsu expressway we were behind schedule and missed Ide at the agreed meeting point. Being from Karuizawa he had started there and was supposed to link up with us at Fujino on the Kanetsu. We’d planned that if either of us was late the other would go on ahead and stick to their schedule. So we met him finally at Tobu Yonamura, the 1st agreed fuel stop on the Joshinetsu. Not before riding through some ghostly thick dawn fog. That really slowed us down. On arrival Ide had been waiting a while and told us it was -3deg. This was mountain country and winter still had teeth. Poor Ide seemed more an ice arse than an ironbutt. 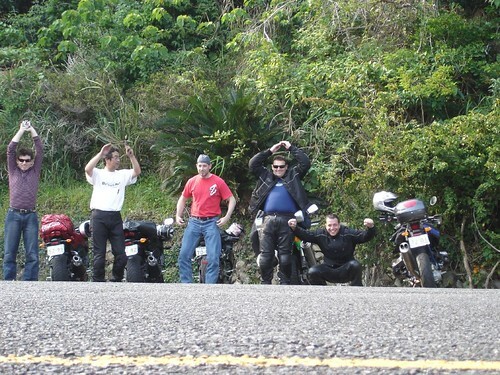 But we fuelled up, threw on some extra layers and hit the road to warm our asses. Heading down out of the mountains to the Sea of Japan was a warming relief. The ice capped mountain views were captivating, almost to the point of distraction. We were back to making good time and the sun was up at our backs, thawing us out. 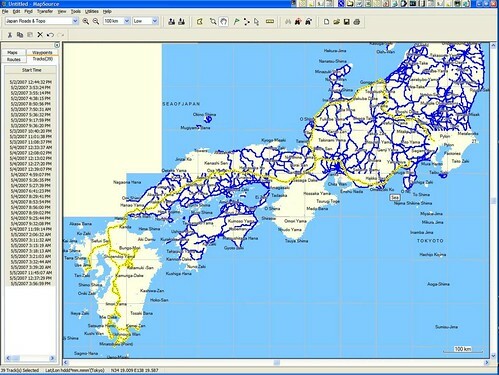 On hitting the coast we jumped the west bound Hokuriku and followed the coast. It was my 1st view of it and gave me some encouragement. Remember thinking, “this is but the 1st of many new things you’ll see”. This took us to our next fuel stop at Arisoumi and our 1st distance miscalculation. What should have been 205km became 225km between fuel stops. Luckily everyone made it. Maybe the downhill run to the ocean had saved us some wrist twisting. By the time we got into Arisoumi distance, time and speed had broken us up. James, Tony and myself were making good progress together while Ide and Michel were a little way behind. Ide did an F1 fuel stop and headed on out before us, while Michel came in as we were on the way out. I was starving and snuck in a quick bowl of ramen. I don’t know if it was highway fever or a local dialect thing, but the old lady at the counter seamed to be speaking gibberish. She had to tell me about 10 times before I got it. Imagine her surprise when another foreigner, Michel, rocks in 10min later and has the same problem. All at around half seven in the morning. Back on the road we had our first directional problem. My mistake. I saw 2 signs: ####Hokuriku & Noetsu. So I took the ####Hokuriku with James and Tony trailing. Then I noticed it was heading inland and the Hokuriku was meant to follow the coast around here. Luckily we were only 50 or so metres into the exit ramp. So, stop shuffle back and jump across to the Noetsu line. On the road again and making steady progress following the signs to Osaka. Eventually the road turned south and then inland. To be honest I don’t remember much of this leg other than some geriatric trophy Harley riders crawling along, taking up the whole road and not wanting to move over. A situation we became accustomed too over the next week. Oh, I forgot the bugs. Bazillions of em. A sign of things to come. Maybe that’s why I don’t remember much because I couldn’t see out my visor. Next stop was Nanjyo SA. By this stage some 600km in, around 9am. Here one of the Harley riders came over to heckle us and explain his passion, riding friend’s history and generally hang around. Now, he wasn’t too popular with me at this point and add to this I had the post ramen tummy rumbles and generally felt crusty. So he got the polite weather comments and that’s it. Luckily he couldn’t see the highway fever building behind my sunglasses. Moving on we made our way down to the Meishin and turned west into Kansai. A rider from Kansai (haildamage) had given us the heads up on the local spaghetti tarmac in his area and recommended the Keiji bypass to avoid the traffic. And just as he had said, the heaviest traffic was banked up to where the Keiji splits off. That was a big time saver. Through this stretch I was taking my turn in lead and had to stop to query what road we were on. Tony pulled up and said “This is the Chugoku, let’s go” and he took the lead. The master navigator was making his first move. Once through the built up areas things thinned out and we were rolling along nicely again. Nishinomiya was an important stop for us as it signified @800km in and the halfway mark. Lots of “OOoos” and “AAaahs” and “can’t believe we are here”s. The weather was great, traffic not too heavy and perfect riding conditions. We were making reasonable time and a little ahead of schedule as we had hoped. So we hit the road again for Daisa SA. This was the beginning of the Chugoku and the best expressway I’ve ridden in Japan so far. Virtually no straight road, plenty of elevation changes, smooth flowing turns, great corner ahead views and fantastic roadside scenery. A very entertaining and time devouring road. For some this may be a nightmare, but straightaways send me to sleep. I think from their enthusiasm Tony and especially James would agree. But all that entertainment and effort takes its toll and coming out of Daisa the fatigue was telling me a nap at Yoshiwa SA was a smart pre-emptive move. Pulling in to Yoshiwa tired, but satisfied I settled on a bowl of hot miso soba and a few choco-pie to help me sleep well. Tony, James and Ide soon joined in the feast and we had the closest thing to a group meal yet. After our little feast, Tony decided to join the nap while James and Ide moved on. With Tony I found some nice shaded area and spotted a particularly comfy looking rock (?.. must have been the fatigue) nicely angled for an upright nap. While Tony disappeared behind the rocks for some seclusion. Pulled the neck warmer up over my eyes and face and laid back for some much needed zzzs. 25minutes later and the keitai alarm was sounding calling us back to duty. I heard another buzzing sound overhead and on feeling around the open area on top of my head where the neck warmer couldn’t reach I found that 25 minutes seemed to have been long enough for a small civilization of various flying insects to make a new ecosystem out of my head. A shake, many flicks and some dancing around had their new city in taters and me fully awake. Nature, the best alarm clock! Reloaded the FZ and rolled over to the gas stand to fuel up. Here I made the 1st attempt to fill the FZ’s tank to the brim. Yamaha says it’ll take 18 litres but the nozzle restrictor seemed to only allow jus over 17 litres so I kept repeating “mo chotto” to the pump monkey until it had taken 18.5 litres plus whatever was left in there. Admittedly the FZ had rolled into Yoshiwa on fumes but I now think it can easily take 19+litres. Hooked up with Tony and hit the snaking Chugoku again. Next stop was Mito to pick up Jef, our end witness, who was in the area and would join us for the remainder of the trip. Unfortunately, we had misread the Kanji for Mito as Bitou and over shot it. A quick call from Tony to Jef had him meeting us at the next PA with a 15minute delay. 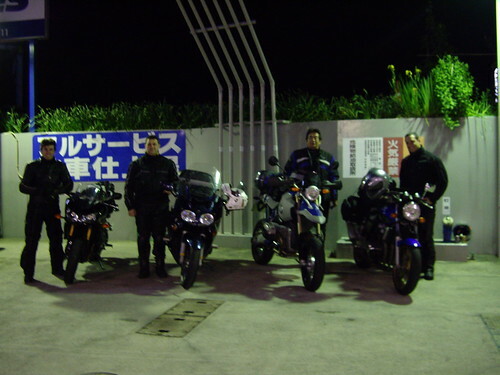 Then we were 3 and on the way to leaving west Honshu through Shimonoseki to Koga for our next gas up. 5 minutes into Kyushu we saw our first highway patrol and had to slow down to a crawl, with the rest of the traffic that was banking up, and wait for them to turn off. Which they did. By this time the sun was dipping, the weather was noticeably warmer and summery and my spirits were high. Pulling into Koga was a relief and a shock. For starters we calculated we had done some 1400km and were well on schedule. But a mail had came in that Michel had spent an hour in the back seat of a highway patrol car while they explained to him that passing on the left was a no-no and gave him a ticket for his trouble. The funniest part was hearing his telling of how the only thing he could think about was the ticking of the Ironbutt 24hr time clock. The only time he had wished for a ticket, so he could get on his way. As we were pulling out of Koga, after a decent stop, he came rolling in. Even through his troubles he urged us to push on ahead and not to delay our own schedule for his. That’s the spirit! Next stop was Miyahara on the Kyushu Expressway. The weather was perfect for night riding and we were on the home leg. Ahead, James had been hooked with Ide for a while. Tony, Jef and myself were swapping lead duties and Michel was wagging the tail. Everybody, other than Tony and I, had been happy to keep on rolling without any naps or sleeps so we were quite a bit ahead of schedule, maybe 3 or so hours. The weather and Ide’s consistency probably played the largest part in this. By the time we left Miyahara we were on the home leg and looking forward to finding the elusive 24hr gas stand on the short stretch between the Kagoshima IC and the Ibusuki skyline. The tail end of the Kyushu expressway was also quite entertaining in the moonlit night with its rolling hills and smooth bends, perfect for our weary bones. On exiting the expressway, after some 16-1700km we finally met a toll gate and had to pay the piper. Those with ETC machines 16300yen those without @22000yen. Staggering on to the end had us pull into the Chuzan IC Mobil gas stand for the end of the ironbutt ride. We took photos, laughed and clapped each other on the shoulder a lot. Surprisingly noone collapsed, complained or whinged. Everybody was tired, sure, but we were all elated to have completed the run safely and successfully. Following this we took a parade run down the Ibusuki skyline. Very spooky, often deadly and just the trick after so many highway kilometres. However, we did manage to lose Michel, or should I say he got himself lost. After waiting 10 maybe 15 minutes I headed back down that dastardly road to look for him. First I saw a Tanuki scampering across the road and then a rabbit bounding across the high beam but no Michel. The Ibusuki Skyline is about 30km long and around the 20 km mark I began to get worried. First thought, he’s crashed off a cliff and I missed him. Second, there’s some weird kami down here that picks off lone tail enders and more than likely loners. Then the white lady story got into my head. This got my neck hair standing on end. At the 25 km mark I found him riding very slowly off his map. Yep, wrong turn or something. On the way back we met Tony worried they’d lost me too. Back together as a group we headed for central Ibusuky and our final rest destination Joyful Family Restaurant. 24hr, food and comfy seats. Perfect. We ate like wild animals and all crashed at one point or another, wether it was to zombie state or deeper. Michel fell asleep in his chair. Ide laid down on a comfy bench and rested his eyes for a bit and James took a brief rest on the astro-turf out front. Reluctantly we rose, collected our delivered travelling bags (which we’d sent down a few days before) and headed for a park to camp. Some set tents and others, Ide and James, just rugged up and collapsed on the grass. Before I was even in my sleeping bag I could hear Ide snoring away with the night bugs. All in all an awesome ride. 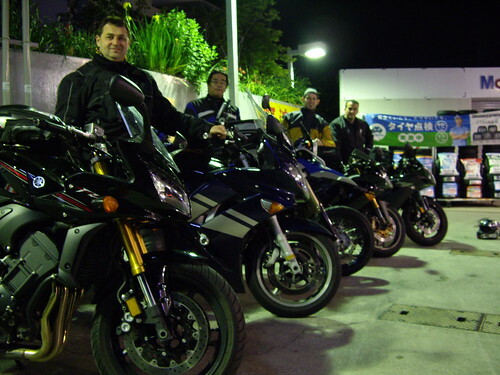 We took the next few days to sample some of Kyushu’s best roads and had some sensational rides. But in time the ironbutt will continue to shine as the brightest memory. Will I do it again? You betchya! Next will be 2000km in 24hrs. In the meantime I’ll be training. See you on the road… . February 1, 2013 in Ironbutt.